Columbia Gas has opened a new shelter in Lawrence for victims of the Merrimack Valley gas explosions last month. A shelter with 250 cots, a dining room and outdoor shower trailers opened in Lawrence on Monday, providing another temporary housing option to thousands of Columbia Gas customers who were left without heat and hot water after the Sept. 13 disaster rocked the Merrimack Valley. The shelter, which is located at 46 Stafford St., in the Malden Mills area, can accommodate as many as 1,000 people, if necessary. 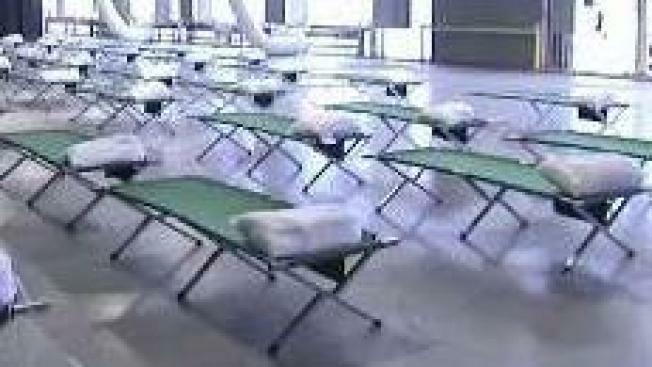 As of Monday afternoon, not a single person had taken one of the cots. "This is New England in October, so the weather could turn cold," said Scott Ferson, a Columbia Gas spokesman. "We don't want to at that point think about how to shelter people." The company is also offering ridesharing services from Uber and Lyft. The 30-foot trailers accommodate up to eight people, and include kitchens, bathrooms and showers. "If it turns cold, and people need a place to go, then the places are already in place," Ferson said. The company said it expects to restore gas service to affected customers by Nov. 19. Anyone who needs temporary housing may call Columbia Gas at 1-800-590-5571.